7 March – what a night! 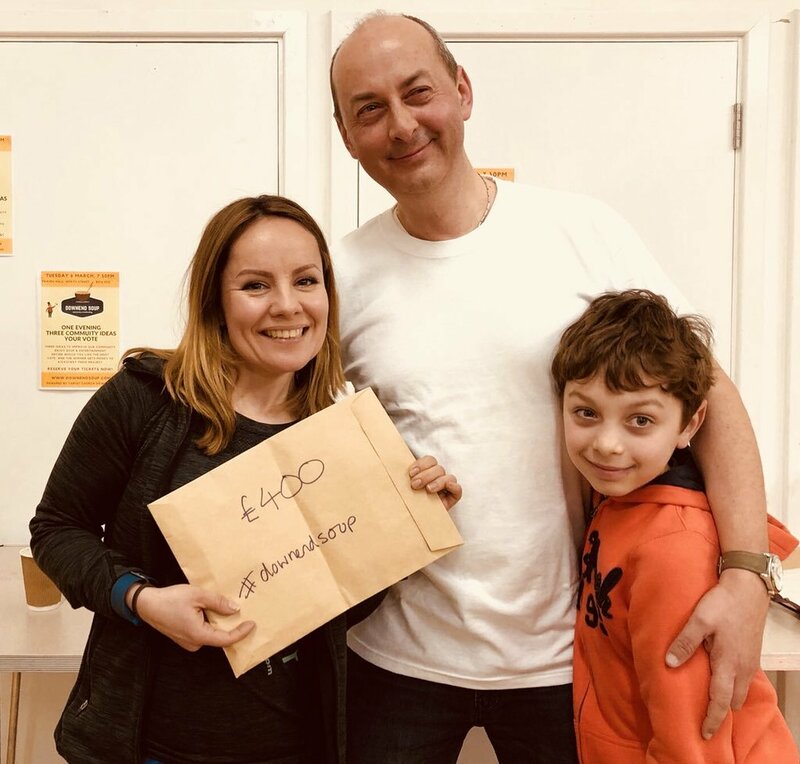 From an empty Parish Hall in Downend, to a thriving evening full of goodwill, fantastic ideas and of course great SOUP, we’ve now officially joined the world-wide network of SOUP community crowdfunders here in tiny Downend. Over 100 people joined us on 7 March to hear ideas from Crisis Centre, Hives and Herbals and Mothers for Mothers. In the end the cash prize of nearly £500 went to Karly and her pitch for Mothers 4 Mothers. We look forward to seeing them come back later in the year to tell us more about exciting plans to bring a support centre for mothers suffering from pre and post natal depression to our neighbourhood. Pitch quality was excellent and Alison entertained us greatly with her Queen bee outfit and proving that SOUP is also about supporting community enterprise as well as charity. And who can forget the amazing voice of Suzie Dobson, herself about to launch a kickstarter for a new EP. We hope you enjoyed the night. A final shout out to all our community helpers and sponsors who contributed goods and services in kind to make the evening run with zero operating costs and it’s only through this that we can promise that every penny through the door goes out to a good cause. Let’s continue our journey of create change, for good, one bowl at a time. First things first – we want your ideas and will do all we can to ensure you get an opportunity to present them to the community. We set up Downend SOUP to help community groups and social enterprises flourish. We want you to succeed. We’ve now filled the pitch places for Downend SOUP 2 on 3rd October 2017, but if you’re feeling inspired and want to be considered for a future Downend SOUP you can complete an application form here: it’ll say 3rd Octber but don’t worry we won’t make you fill in a form twice. We’ve made it as easy as possible; no difficult questions and under five minutes to apply. If you get stuck at any point, drop us an email downendsoup@gmail.com. We want you to succeed. First. Don’t be scared, this isn’t a Dragons Den type of thing. Downend SOUP is about bringing community ideas to life and people come to SOUP because they care about community issues. On the night, the votes cast will determine who walks away with micro-funding but all groups that are pitching benefit from airtime and exposure of their ideas and you never know (and it does happen), there may be someone in the audience who takes a personal interest in your idea regardless of whether it wins on the night. We absolutely encourage our audience to offer advice, assistance and contacts to everyone pitching. Second. It’s about bringing good ideas to life so you don’t need to be a registered charity, CIC or anything really. In fact you may not have started your project yet and are looking for community support and that’s fine too. You can be any age. You don’t have to live in or execute your project in Downend. Our friends Bristol SOUP support ideas in the city centre and we want to ensure projects in South Gloucestershire have similar support. The more the audience relate to your idea, the more likely your success. In the end, they decide. Third. It’s not a battle of powerpoint skills so we won’t provide a projector. You can use other visual aids – some people fashion themselves a cardboard or even human flipchart – some rely on the power of group presentation – others on the power of a single voice. Entirely your choice. We’d ask the maximum number of people involved in pitching should be five. And in line with the rule of five, you will have five minutes to explain your idea followed by five minutes where the audience can ask a maximum of five questions. Try thinking about how to make the idea really simple – what is the problem, why does it exist, how does it affect people, how will the idea help, why is no-one else doing this currently, how will micro-funding from SOUP help you. Oh, and if you haven’t got the idea by now let’s be clear – we want you to succeed.